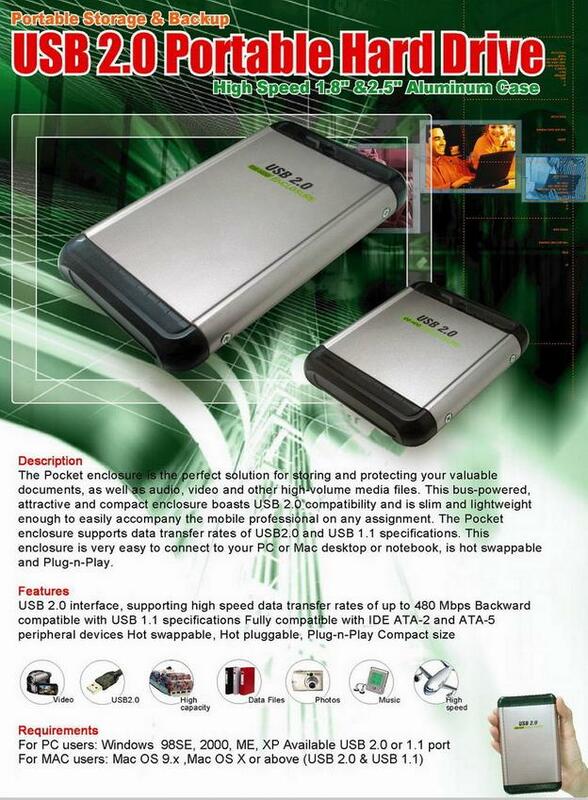 The USB 2.0 MULTI in 1 card reader is a very handy product. It not only read and save data from Micro Drive,CF type I/ II, SM, MS, SD, and MMC but also installed without drivers at Win 98SE/ME/2000/XP. This pocket size device can be carried and used anywhere you go. Nowadays, Flash Memory has various formats and sizes. Our MULTI in 1 card reader allows you to read, write and erase data from MULTI most popular cards with just one card reader/writer. Compiles with USB Storage Class specification Ver.1.0(Bulk only protocol). Support Plug & Play and Hot-Swap. You can easily write/read data to/from the storage cards or exchange data in different cards. Complies with USB Storage Class specification Ver.1.0(Bulk only protocol). > SM Slot: SM, XD, SMC. Support Windows 98SE/ ME/ 2000/ XP/ Mac OS 10.2 above.